My hubby and I have been married for 15 years. We have 4 boys and live in Laie HI. Where my husband works for BYU Hawaii. 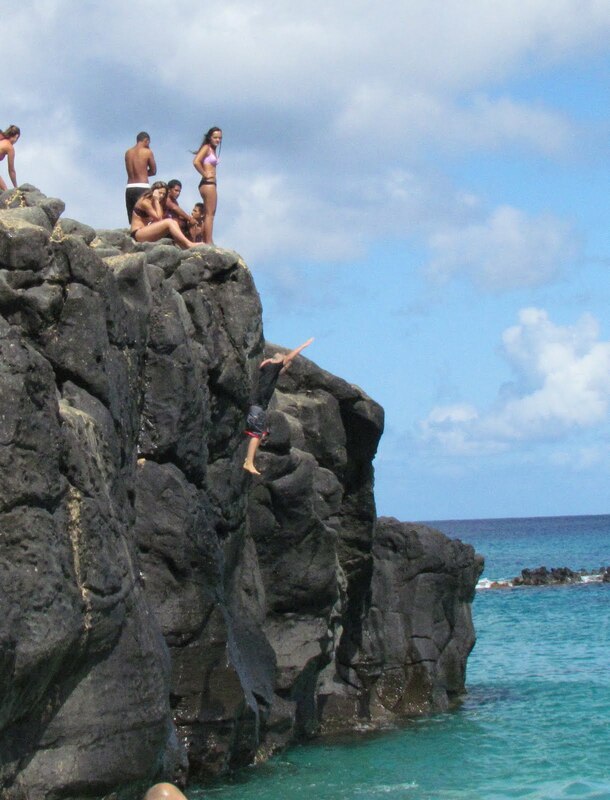 and in the summer, jumping off its huge rock cliff. Notice rainbow in background. It was pouring rain minutes before. This was a bell tower to the right of the Bay, I just thought it looked picturesque. And "A" who tries to get out of all the pictures. I think we teased him to much. When he was little he always had to be in every picture so we teased, but now he won't let me take a picture of him. Before we showed up there was a couple modeling for a photo shoot in this exact spot. So we had to get a picture there as well. Glad we did, look at the clear blue water. And here is the rock. Notice T in mid air. The boys all( well everyone but lil B) jumped non stop. By the end of the 2 hour period we were there, B and T were jumping backwards and doing twists. Then they begged to go back a couple days later. I never got brave enough to jump off that rock. So fun! Looks so fun and beautiful! I am so jealous of the fun you are having. Tyler made pictures and notes for all the boys, I'll mail them off soon. Miss you guys!! Crazy! I don't think I could ever do that! Well maybe with floaties on I would. LOVE IT! That pic in the modeling spot is to die for. Go Tal Tal! !